THE Chief Secretary Ambassador, Isaac Lupari has urged public servants to stop illegal business operations in the country. 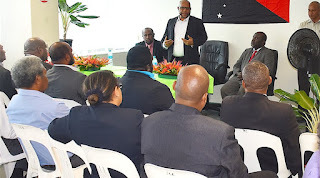 Amb Lupari said PNG has experienced influx of foreign businessmen and women who were illegally conducting business activities in the country for many years until this year many were caught in the recent joint operations conducted by PNG Customs, Police and PNG Immigration Office. He said those people who came to PNG should not have come here in the first place but there is someone letting them in the country. He said few among many good public servants and corporate citizens who are collaborating with the few foreigners to do businesses illegally through bribery and other evil means by evading the laws of this land. “When you earn the money through hard way, then you will find the satisfaction of the life that you earn,” Amb Lupari said. He said the few corrupted officers who also helping out those illegal companies who are not paying tax should face the full force of the laws and termination from the public service.